A stroke occurs if an area of brain tissue is deprived of its blood supply, causing brain cells to lose their supply of oxygen. This is usually caused by a blockage or burst blood vessel. Without oxygen, brain cells can become irreversibly damaged within minutes. Unlike other cells in the body, if brain cells are irreversibly damaged then they are unable to heal themselves. The brain, however, is very adaptable, and areas of the brain are capable of learning new tasks to compensate for the areas that have been damaged (neuroplasticity). There are two types of stroke: the ischaemic, responsible for 90% of the strokes, and haemorrhagic (10%). 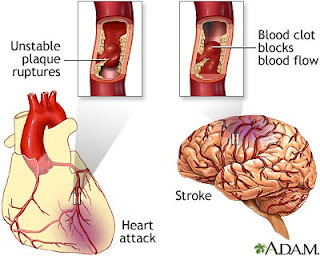 Ischaemic stokes are caused by a blockage within an artery, which will restrict the blood flow to an area of the brain. Therefore, the brain cells of this area will be damaged, due to a lack of oxygen. Haemorrhagic strokes are caused by a rupture of a blood vessel in the brain, causing bleeding in a particular area. This will cause high pressure and will damage the delicate brain tissue. 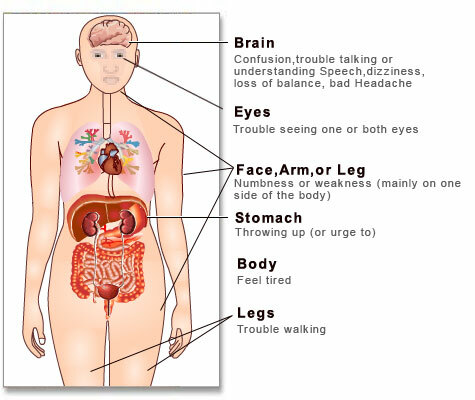 The blood flow is restricted to other areas of the brain, which can cause damage to this area, due to lack of oxygen . According to the National Stroke Association, every forty-five seconds someone has a stroke. More than 795,000 strokes occur annually, making stroke a leading cause of adult disability. However, there are a number of stroke risk factors that, if you keep them under attention, can prevent and reduce your stroke risk. These include your blood pressure, being this the leading risk factor for stroke and should be checked at least once a year, atrial fibrillation (AF), an irregular heartbeat (dizziness, shortness of breath, or sudden pounding or fluttering in the chest can be beginning symptoms), smoking, which doubles the risk of stroke, drinking excessively (more than two glasses of wine), your cholesterol, and diabetes. Besides paying attention to your stroke risk factors, you should also include exercise in your daily routine, a lower sodium and lower fat diet, and eat your vegetables . National Stroke Association. Stroke 101.